The Caterpillar: An Morvil Kornek / The Horned Whale by Jeremy Schanche - available at all ebook distributors, in all formats! 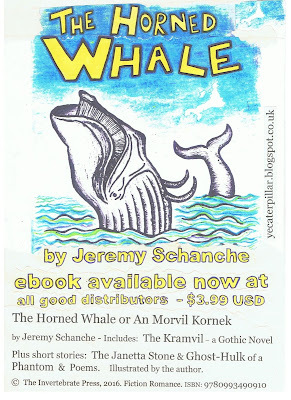 An Morvil Kornek / The Horned Whale by Jeremy Schanche - available at all ebook distributors, in all formats! Come to Penwithershins and check out the Underground as Old Janner shows Pat Vulgata round the labyrinths of the mine in The Janetta Stone. Dark New Lynsmouth has seen many tribulations, but none so great as that set forth in The Kramvil, a gothic novel of eldritch and extraordinary phenomena which unwinds its thread through the twisting alleys of the Old Quarter. When the studious Elias Gillpington runs into the audacious scientist Lazarus Taxon, the wings of fate soon becloud the Keltek sky. As the shadow falls upon New Lynsmouth, Elias sees a glint of light in the presence of the beautiful Miss Constance Place. The story pulses and pullulates with life like a seething vat of yeast infested by furious clouds of flies and wasps on a sunny day, in an ancient lithograph of old Bombay. 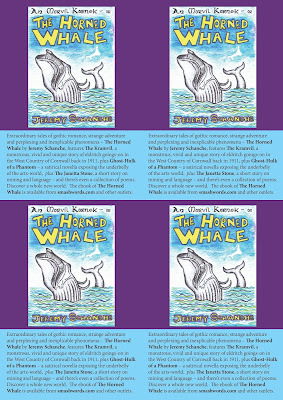 Potent, frothy, well-charged and heady, this electric manuscript will give you the skittering jitters and chill your rattling trotters. The collection of Poems will most likely sneak up on yous from downwind and lasso yous off to a land of golden sunshine, rustling leaves and phonographs furling out foxtrots 'fore rustling ya rational-mind and dry-gulching yous in Tuskaloosa or somewheres or some or other such place. Next, for the word-hungry among ye, we have a couple of glossaries to teach the tongues of talking. 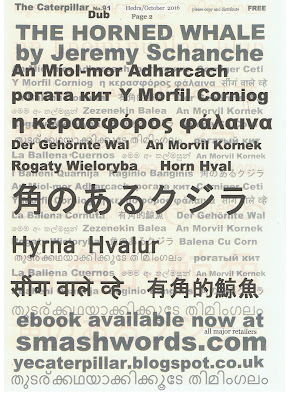 First be the Gerlyvryn Kernouac which explains some words of the ancient Cornish language which appear in the stories. 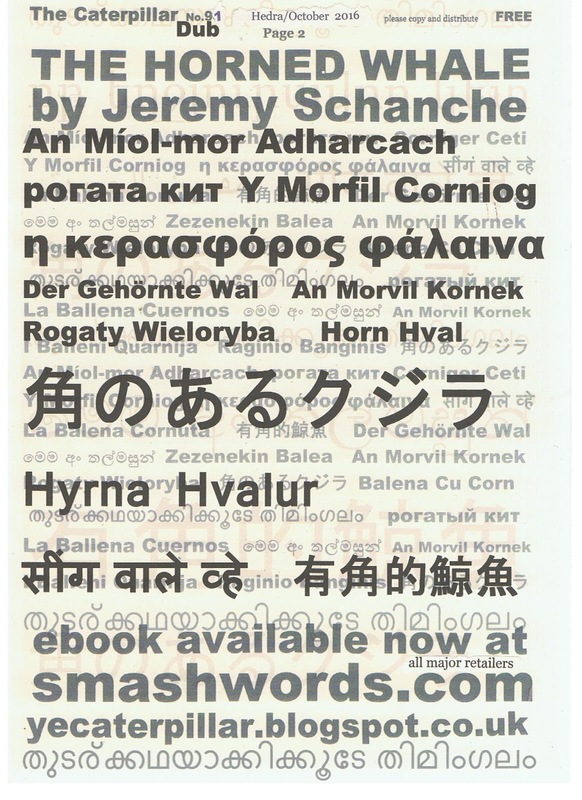 Then we have the International Glossary which covers words from overseas, ancient and modern, as well as some archaic forms of Sowsnek, or 'English'. 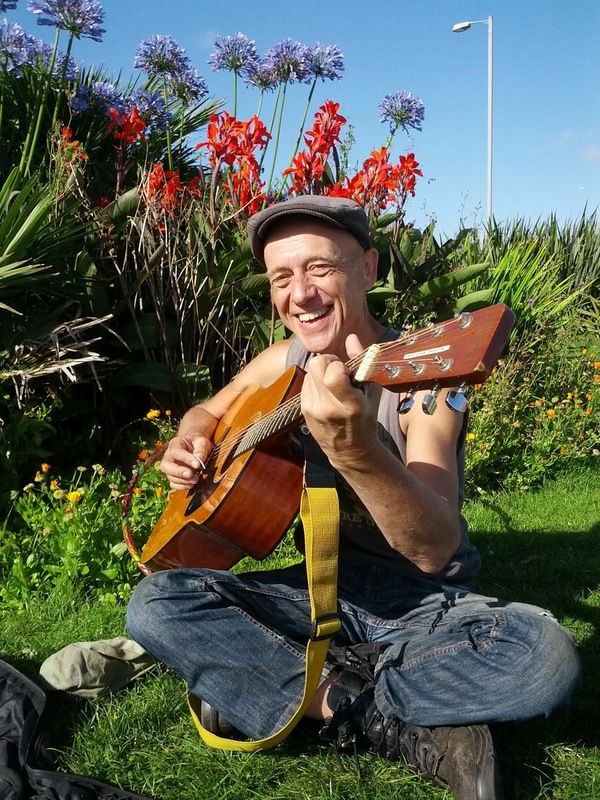 For our closing act, we have Ghost-Hulk of a Phantom, a darkly comic portrait of a struggling writer - a halucinatory roulade of oceanic fervour - a splattering of adrenalin on a canvas of vast cabbage-fields. 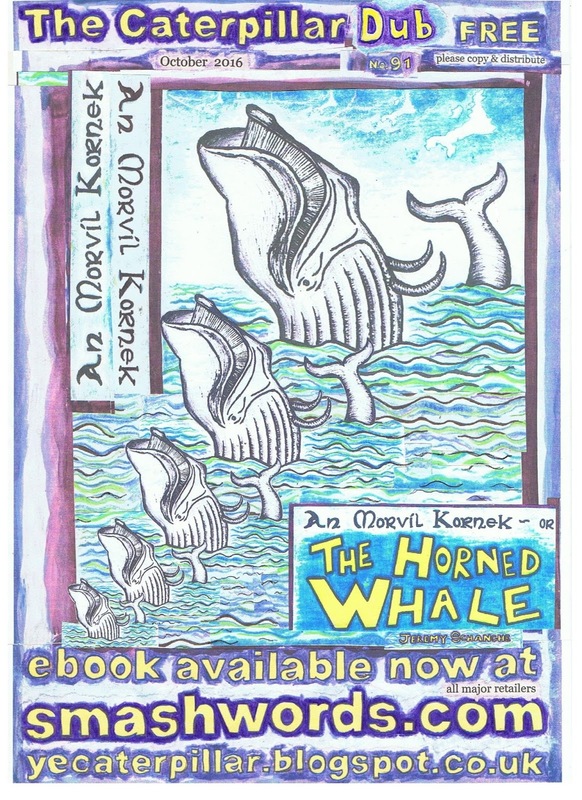 To cut a John Dory short and chase the choice cuts I gotta say that An Morvil Kornek or The Horned Whale is the kind of book the lack of which would crook and rook up your reading-life by an absence of the positive presence of its very special form of effervescence. 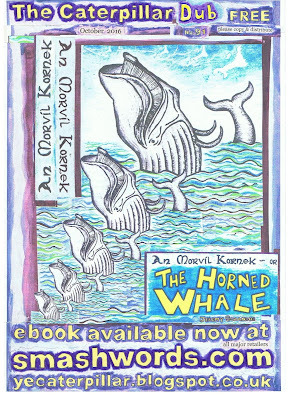 Why not go totally hog-wild and print out a poster for ya home or the twisting back-alleys of your juddering home-town, ya sprawling metropolis or ya muddy one-horse village-street? 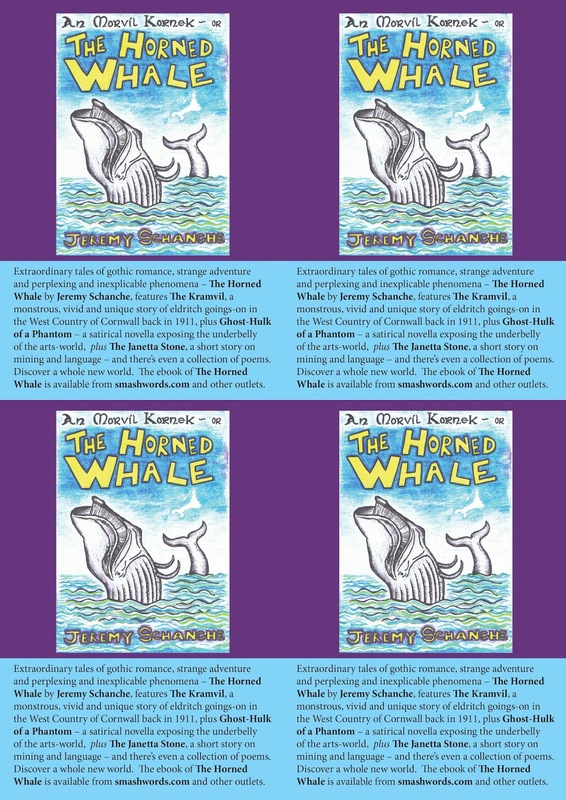 Hope you like the stories! And remember, you can't judge a rook by its plover. Take it easy now, but take it!